Dear Reader, I hope you’ve experienced joy today. I have experienced the special joy of discovering a fine mind and writer. For me it’s the joy of wanting to know more about their ideas and their progress on an important project. My discovery was Finnish author Lauri Muranen, proprietor of The Efficient Revolution. I became aware of Lauri recently when I noticed smart Tweets originating from one @LauriMuranen. That meant we were following some of the same people — an indication that Lauri may be someone I will profit from following — he could be a source of fresh ideas and perspectives. So, what happened today was Lauri replied to Richard Tol’s citation — a citation of what I took to be another tiresome “peak planet” piece. I got only so far as the Guardian headline, that was enough for me. Limits to Growth was right. New research shows we’re nearing collapse: Four decades after the book was published, Limit to Growth’s forecasts have been vindicated by new Australian research. Expect the early stages of global collapse to start appearing soon. Minutes later Lauri tweeted to Richard “I suppose it didn’t occur to the authors that most of the indicators they present paint a rather positive picture”. Hmm… I conclude that I need to go back and actually read that article. Lauri was precisely correct — read the linked piece, you’ll see why I was motivated to go one more step — to see where else Lauri is writing. 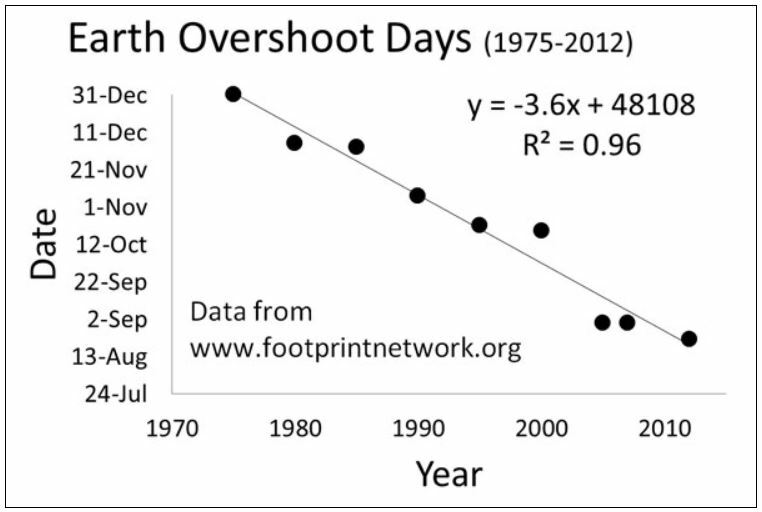 My good fortune today was that Lauri’s topmost post was The World Overshoot Day, headed by the above Earth Overshoot Days graphic. That “closes the sale”, for now I know I need to read further. Looking for Lauri’s RSS feed, I don’t find it on the homepage, so I open the homepage source to search for the usual RSS/feed keywords. Ah, there it is — so Lauri is added to my Energy Policy feeds, then I go back to reading About The Efficient Revolution. May I explain why I’ve bothered to write about today’s discovery? That’s because this is a good example of the discovery process by which I grow my “circle of trust”. That’s a terrible name, but it’s what I have for many years called the group of thinkers that get a share of my attention. My attention is just about the most valuable thing I have, so I try to squeeze the most value I can from the scarce minutes of my attention. So what happened here is very simple. I follow on Twitter a very clever Dutch energy economist Richard Tol or @RichardTol. I do that because I learn new things from Richard, while he is very careful not to waste my attention. E.g., by tweeting 50 items per day. By sharing those citations with me, Richard curates a part of his world. For me the signal-to-noise ratio of Richard’s transmission is very high, so we have a deal. All the members of my “circle of trust” are like Richard, in that they are much more clever than I, so devoting some of my attention to their signal rewards me highly for the fragments of time I’m able to spend with them. As you’ve probably surmised, everyone in my “circle of trust” got there via referral by earlier members. After reading some of the new candidate’s work I may decide to give them a probationary membership. They keep the membership so long as they hold up their end: very high-quality and high-signal-to-noise. The efficient revolution is my attempt to write a ‘crowd sourced’ book about the story how humanity has been able to cut its chains of virtual slavery to the finite boundaries of earth. The success has been achieved via circumventing those boundaries with efficiency – by getting more out from less. Moreover there is plenty of evidence suggesting that this will be the way we can escape our current predicament. Let me explain why this particular story and why crowd sourced. One often hears that we are on the brink of peak this or verge of that. Be it oil, phosphorus, fresh water, employment or common sense. In effect, we are told that we are overshooting the environment’s capacity to replenish resources on par with our consumption. While overconsumption does present major challenges, I would argue that this line of thinking constitutes a Malthusian thought trap. Reverend Thomas Robert Malthus was an English economist, who predicted in his 1798 classic An Essay to the Principle of Population, that England would soon face severe food crisis due to quickly rising population. The idea was that while human population is growing exponentially (1, 2, 4, 8…), food production only grows linearly (1, 2, 3, 4…). The inevitable consequence of such development is that at some point food consumption will exceed food production and hunger will result. This dilemma is known as a Malthusian trap. What I call a Malthusian thought trap is the failure to appreciate the dynamics of developed human societies to innovate their way out of such traps, as happened in England in the 1800s and as is happening in the world today. A Malthusian prediction, such as the famous Club of Rome prediction on the depletion of world’s resources, assumes that societies stand idly by as the proverbial house around them is on fire. This is not the case of course. The central argument of this book/blog is that human societies have been far better able to escape the traps of finite resources and environmental constraints (amid growing populations) than they get credit for. Sold? Excellent — you can see how I got hooked:-) Not sold? Well, did you see how Lauri introduces the Comment area of each post? CONVINCE ME I AM WRONG AND I WILL PROMISE TO CHANGE MY MIND!